I love spending the first few days getting to know my new class. We do lots of "getting to know you" types of activities, including interviews, writings, and surveys. One of my favorite activities to learn about my students are our "Class Graphs." Students are paired together and given a question to ask the rest of their classmates. They are provided with a recording sheet with all students' names prewritten on it to make it easier for them. They have a lot of fun walking around meeting each other and asking questions. Once all data is gathered, they tally the results and create a graph. I post these graphs to our class website so that families can learn more about our class as a whole. I also hang them out in the hall so that other classes and visitors can get a glimpse of our class. Once these are taken down, I bind them into a class book and students always enjoy reading it! Later in the year when we do our graphing unit, I pull this book back out and use it for having students formulate questions about graphs. This is one of my favorite activities because it is so informative and educational at the same time! 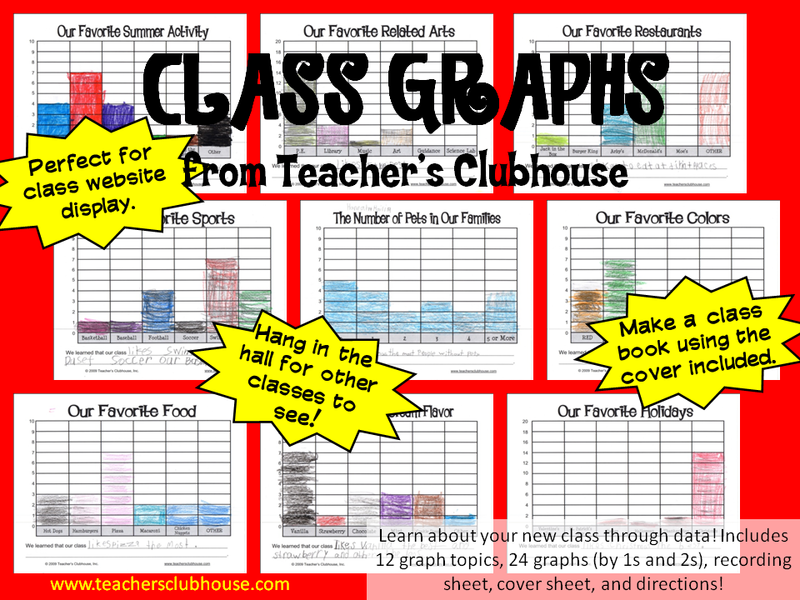 This activity is $0.99 at Teacher's Clubhouse and includes 12 graph topics, 24 graphs (by 1s and 2s), recording sheet, cover sheet, and directions. What types of activities do you like to do to get to know your new students better? I just finished my first full week with my students and we used those class graphs to get to know each other and focus on graphing. I loved that I was able to open up the file on my Promethean Board and show the students how each student represents one bar on the graph. 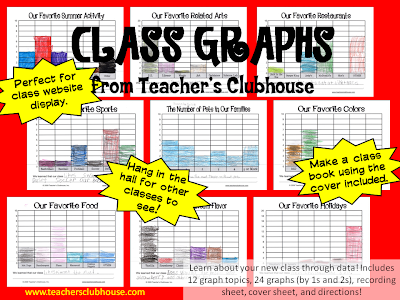 I love all the resources on Teacher's Clubhouse and have been using them for years. That is such a cute idea. I did used a similar get to know you idea with a game for my 8th graders. I wrote questions on a beach ball using a Sharpie and we tossed the ball around the room. Whatever question your right thumb landed on, that's the one you read out loud and answered. They loved being able to stand up and toss the ball as well as throwing it to me to incorporate me in the game. I love this! what a great idea Amanda! This is so cute!! This year my class did Me-Bags! We do the cutest self portraits at the beginning of the year! They're posted on my blog!